You can have the experience of flying like birds ! Join us and have an instructional paragliding tandem flight in Serra da Moeda BH ( Know as Topo do mundo or Top of the World ) with one of our instructors and discover this incredible sport! The instructional tandem flight is the fastest and easiest way to experience the dream of flying like birds! The passenger­student will receive a preview lecture to the flight , which will be taught the basics of paragliding and flight security. The fligth itself is performed by a qualified and certified instructor who will fly with the passenger­student, thus being able to contemplate the beauty of free flight ! 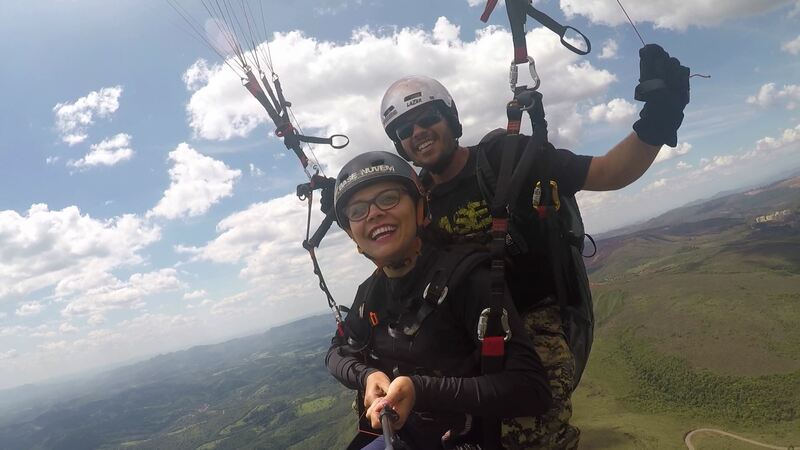 The Base da Nuvem Paragliding School has instructors qualified by the Brazilian Association of Free Flying (ABVL ­ Associação Brasileira de Voo Livre) with several years of experience in the sport. Check out our team here. The equipment used in the tandem flight are specially built for this purpose, approved in international safety. We use safety equipment such as air bag for passenger and security locks in the seats to offer more comfort and safety to our passengers . The tandem flight always depends on the weather condition of the scheduled flight day. We instruct you to contact us for information on the weather forecast in advance. We recommend coming with tennis shoes, pants, and jacket for the cold days. This is a mandatory procedure to experience the instructional tandem flight, and it is in accordance with the regulations of both local club ­ CVLBH (where is held the flight) and ANAC ( National Civil Aviation Agency ). Buy Now your INSTRUCTIONAL tandem flight through PagSeguro. It can be payable in up 12 monthly instalments! * *Special Camcorder for adventure sports , Full HD. * Instructional tandem flight differs from recreational tandem flight. Recreational tandem flight, cannot be charged for it. It is only an alternative to the pilots be able to fly tandem with relatives or spouses, according to regulations of the local club . Check out some videos of those who already enjoyed a tandem flight with us! Check out more videos on our YouTube channel YouTube. We also offer another flight mode : the tandem paratrike! Base da Nuvem - Todos os Direitos Reservados © 2018. Designed by MageeWP Themes.